Nowadays, there's so much chemical garbage in the food that we eat, and products that we use on a daily basis...including pillows. Our skin comes into direct contact with pillows on a nightly basis, so if I can find an organic and chemical free pillow for the Grey, why wouldn't I? As long as it doesn't cost me an arm and a leg anyways. So I had my tester sleep on this pillow for a few weeks, and it was harder than one would think to get him to do so at first...tell toddler to sleep on pillow, done...right? Nope, Greyson loved the thought of his own pillow but I had to bribe him *ahem* coax him to sleep with the pillow for a few nights...and after those few nights he refused to lend the pillow to me to test! How rude! I actually had a full on conversation on why I needed the pillow for one night, after much discussion and debate, he agreed to lend me his pillow for a night so I could test it. I have to say that it's pretty comfortable and I wish they made an adult size! The organic cotton sateen covering was soft against my skin, and had a good amount of "slip" to it so I didn't risk wrinkling up my face (always a bonus!). So do I recommend this pillow? Absolutely! The pillow retails on Amazon for about $36 and the pillow case if about $18, yes, I know that $36 is pricey for a toddler pillow, but it's already $20 for a regular mass produced pillow at WalMart...and I can guarantee you won't be able to throw those pillows into the washer and dryer and have it come out comfy. 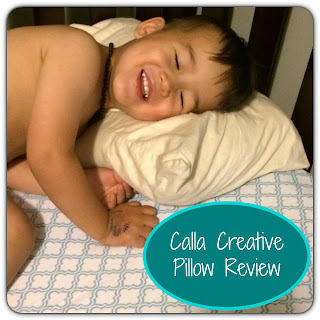 Calla Creative also guarantees their pillow for 3 years, and they have a 90 day money back guarantee. So if you think about having this pillow for at least 3 years, it really only comes out to $12-18 a year...which is probably what you'll end up spending on a pillow every year for your toddler anyways, why not make it an organic and safe pillow for your little one?